4G technology may speed up wireless connections in some cities and on some smartphones. (Wired) -- If your smartphone seems more like a slowphone, hang in there. The next generation of wireless technologies, known as 4G, promises blazing-fast data transmission speeds. 4G is just getting started, and even Sprint's network is only available in a handful of cities. But in just about two years, 4G could be almost everywhere. All major U.S. wireless carriers are working on upgrading their systems to 4G -- though we would prefer if some, like AT&T, got their 3G networks working properly in the meantime. Do I need a new phone to take advantage of 4G? Sure, Apple can add the 4G tag to its next iPhone if it wants to, and "iPhone 4G" is how the company has referred to its next-generation smartphone in legal documents. But we doubt that it will have 4G network connectivity -- unless Apple's creating a phone exclusive to Sprint. 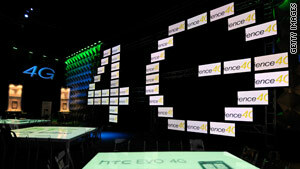 Sprint: Sprint is leading the 4G charge with the network already available in at least 36 cities. By the end of the year, most major cities will be covered by Sprint's 4G network. T-Mobile: T-Mobile is in no hurry to get to 4G. Maybe because it first needs to get its 3G network in order. The wireless carrier is still talking about upgrading its 3G network to 3.5 G or HSPA+. HSPA+ will come to Los Angeles and other major cities in the United States this year, says T-Mobile. 4G is clearly a long way away. MetroPCS: The first LTE 4G phone could come from MetroPCS, which is working with Samsung on the device. MetroPCS plans to start its 4G service later this year in cities such as Las Vegas. Give me some background: What's the history here and how did we get to 4G?